When the amendments to Article 9 of the Uniform Commercial Code become effective in most states on July 1, 2013, the majority of states will require the new national UCC forms. Many states will provide a short grace period where they will continue to accept the old forms, but some may not. In many respects, the new forms do not appear to be substantially different from the ones they are replacing. There are, however, important changes that everyone in the UCC filing and search community should become familiar with in order to avoid confusion, filing delays and unintended actions that could affect the effectiveness of UCC financing statements. The first thing to notice is the complete removal of fields 1e, 1f, and 1g in the debtor name section. These fields pertained to information about entity debtors, such as the type of organization, jurisdiction of organization and organizational identification number. In many jurisdictions, these were required fields in order for the filing office to accept and file the UCC. After July 1, 2013, filers will no longer need to provide this information in the jurisdictions where the amendments become effective. This should make the preparation process easier – especially for foreign (non-U.S.) debtors. Another adjustment to the debtor name section of the new UCC forms is the labeling of the fields for an individual debtor. These fields are now labeled “Individual’s Surname,” “First Personal Name” and “Additional Name(s)/Initial(s)”. In most states, it will be necessary to consult an individuals unexpired state issued driver’s license or unexpired state issued ID card for this information. On occasion, it may not be clear on the ID card which is the surname and which name is the first personal name since Department of Motor Vehicle records have different format/layout protocols when presenting an individual’s name on either the state issued ID card or driver’s license. When unsure about the correct surname and first personal name, the filer always has the option of adding several different versions of the debtor’s name in the additional debtor name fields that are provided. The new UCC1 form allows the filer to place a long individual debtor surname on the Addendum form if it will not fit in the “Individual’s Surname” field. When utilizing this option, the filer must check the box in the debtor name section indicating that the name is being placed in box 10 on the addendum form and the debtor name field must be left blank on the UCC1 form. A design change to reduce the number of pages submitted has shifted the Public-Finance Transaction, Manufactured-Home Transaction and Transmitting Utility designations from the Addendum form to field 6a on the UCC1 form. In addition to this shift, the checkbox indicating “This FINANCING STATEMENT is to be filed (for record) (or recorded) in the REAL ESTATE RECORDS (if applicable)” is relocated from the UCC1 form to the new addendum form. The trust and decedent’s designations have been moved from the Addendum to the UCC1 form and are now in section five. In addition, the language was changed from “Debtor is a __ Trust or ___Trustee acting with respect to property held in trust” to “Collateral is held in a Trust”. The emphasis has shifted from the debtor being a trust to the collateral being held in a trust. A significant change has been made to the amendment addendum form with the addition of a new field. The new field, field thirteen, was created so that when amendments are “…to be filed in the real estate records or in any other filing office where the name of a current debtor is required for indexing purposes…” the UCC3 can be aligned with the correct UCC1 already on record. This field is for cross-referencing purposes only. It is NOT to be used to add, delete or change a debtor name. This form initially was labeled a Correction Statement then, subsequently, a Statement of Claim form. This form has been renamed again to accurately reflect its purpose, which is to “inform” third parties searching the UCC public records. Besides the new name, either the Debtor or Secured Party may now file the UCC5 Information Statement. When either party would like to place additional information on the public record to inform third parties that a “RECORD IS INACCURATE”, RECORD WAS WRONGFULLY FILED” or “RECORD FILED BY PERSON NOT ENTITLES TO DO SO”, a party on the record may file a UCC5 Information Statement. While either a debtor and/or secured party may make a UCC5 filing, neither party is required to do so. 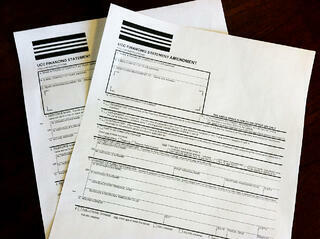 In addition, the filing of this form continues to have no legal effect on the financing statement. The UCC Information Statement is for information purposes only. All the new UCC forms will appear familiar to filers and searchers because many of the same fields and requirements still exist. Note that while some changes may appear minor, it is important to spend some time becoming familiar with what has changed and where fields now appear. Finally, many states will offer a grace period by accepting both old and new forms for a limited time before limiting acceptance to only the new forms. Some states have adopted the new law but will only accept the old forms. Other states have not yet enacted the legislation and if they do not enact in time for the July 1, 2013 effective date, only the old/existing forms will be accepted in these jurisdictions. To remain current on the latest news about the Article 9 Amendments, visit the UCC Article 9 Amendments page of the COGENCY GLOBAL INC.'s website. The resources offered on this page include a detailed chart showing the status of the amendments in each state, along with significant non-uniformities in either the enacted or pending legislation.